Jean Boxler in Niedermorschwihr makes Alsace's most captivating Pinot Blanc. The grapes originate from the Grand Cru Brand in neighboring Turckheim. Brand is always floral, fresh wine with a tight focus. Firmness is also a characteristic of Pinot Blanc. As well of the outstandingly talented Jean Boxler. 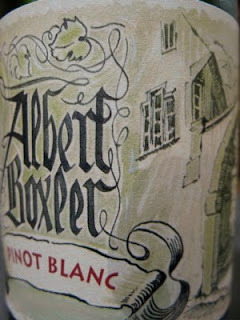 2007 Pinot Blanc "B" is an aromatic wine with fresh herbs, white flowers and coconut in the formidable scent. The taste is as compact as the fist of a heavyweight boxer, with layers of ripe, peachladen fruit and a brutal but mature acidity, which leads to a refreshing minerality on the finish. A great wine with huge qualities. Price: € 11.